Striving For Better, a young five-piece rock group from Williamstown, South Jersey, won the Battle Of The Bands at Rutgers' first annual SLAMfest Friday. Though still in need of some seasoning, the band's brand of emo-pop resisted cliches with guitar riffs that (probably unintentionally) recalled Tom Scholz, Angus Young, and Alex Lifeson. Lead singer Justin, 18, is still in high school, and his performance style was a strangely compelling emo version of Morrissey crossed with David Lee Roth, though he looks and sounds nothing like either of those consummate frontmen. It was fun being a judge. We steered clear of Cowellisms and kept the criticism constructive. Some of the band members were overheard grumbling outside that we had said negative things about them. A Rutgers staffer said he put it in perspective for them, noting that any young band should consider themselves lucky to have a captive audience of music business professionals giving them a free critique. That apparently cheered them up some. It was the last of a stretch of dreary rainy days, but it was still fun to walk around the personal time machine that is the College Avenue Campus. It's weird to see what's changed and what's remained, but the memories that are triggered just by being there are always quite a kick. 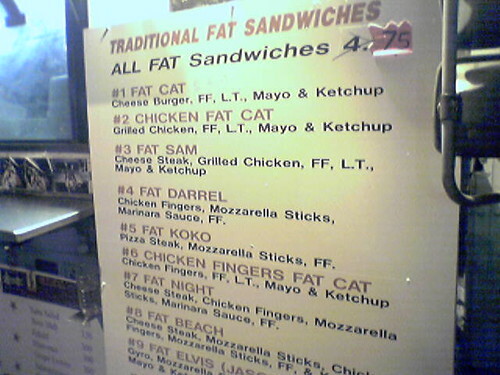 Before getting on the train to leave town, I had my first-ever Fat Darrell, one of the many riduculo-sandwiches that was spun off from the ever-popular Fat Cat at the famous grease trucks some time after I graduated in the mid-'90s. It wasn't altogether awful, but it's surely the sort of sandwich that must taste far better if you're drunk. One wonders how much Maxim had to drink before they selected it the best sandwich in the nation last year. Pics of the bands, the fashion show, and more on the SLAMfest site. Attendance was disappointing, but it was a new event, it had been raining all week, the location had been moved, it was the day after Yom Kippur, and it probably started a little too early in the day. Hopefully they'll have it again next year with a better turnout, because it's a cool idea. Note to the technically inclined: this is my first post using Flickr. I'm tired of random strangers eating up bandwidth by poaching photos I've posted to my ftp site on their MySpace pages and whatnot. If you're a member of the Rutgers community, you can witness my debut as a Battle Of The Bands judge this Friday afternoon at SLAMfest. Yeah, I was asked to be one of the "record industry executives" judging the competition in which five Jersey bands will each play one original song and one cover. We will have microphones and have been encouraged to make rude comments in our best faux British accents. The winner of the battle will get to play a short set before the headliners, New Jersey ska stalwarts Catch 22, who go at 6 p.m. There's also a fashion show and a screening of Batman Begins (to which I keep wanting to say, Batman Begins To What?). It's all going down at the new Sport Club Field on Busch Campus. If it rains—a 60 percent chance as of now—the whole shebang will be at the venerable College Avenue Gym, a place where, as an RU student in the early '90s, I saw shows by the likes of The Replacements, Fishbone, Concrete Blonde, and Penn & Teller. It's also the place where I saw Radiohead open up for Belly, and if memory serves, I took a final exam there once. Get yer SLAMfest info here. As far as I know, this event is only open to Rutgers students, teachers, and administrators. UPDATE, OCTOBER 13: Due to all the rain this week, the event will be at the College Avenue Gym. I feel bad for the RU Recreation Department because they clearly wanted to show off their new facility, but keeping this thing on College Avenue can only help attendance, not to mention affording an aged alumnus like myself more time to stroll around the grounds of the campus where I spent 99.44 percent of my time at the multi-campus university. I could probably count the number of times I went to Busch Campus on my fingers and toes; maybe I'd need one extra hand or foot. On a perhaps unrelated note, the Playlists page is now up to date, including all four gigs from my recent "four gigs in eight days" run. Perhaps one day I will add more old playlists, but in the meantime, the page documents playlists from the vast majority (though not all) of the gigs I've done since 2003. And oh, do I have gigs coming up. At The Goldhawk here in town, I'm doing two of the next three Saturday nights, Rocktober 15 and 29 (the latter is the second half of a doubleheader) plus Friday, Nov. 4. The first half of the Rocktober 29 doubleheader will be that afternoon at Tory Burch. And they're some weeks away but worth marking on your (or at least my) calendar pronto: three big Ding Dong dates on Tuesday, Nov. 1; Friday, Nov. 18; and Thursday, Dec. 1. Full details on the Hoboken Rock City homepage. John Lennon would have been 65 today. Just saying. My friend, former roommate, and to-this-day Hoboken neighbor Keith is in Louisiana with his friend Kambri Crews, volunteering for a week with Pasado's Safe Haven, an animal rescue organization from Washington state that has set up a huge operation on a donated farm outside of New Orleans. Judging from the updates on Kambri's blog, they're cleaning up a lot of poop—surely Triumph is chuckling—and having a challenging but rewarding time. They're obviously working their tails off, but Kambri is posting to her aforementioned blog when time allows, and there are updates on the organization's progress on their news page. Not all the news is good, of course, so be warned that some of the stories and images are upsetting. To make up for that, here's where you click for photos of three-week-old kittens slurping formula. Until some changes are made to Hoboken Rock City's infrastructure, comments will remain inoperative on blog posts. I'd like to enable them, especially since I'm too busy to generate new content on this site as frequently as I would like to. Until this blog becomes comment-friendly, I encourage you to send feedback via the handy contact form. Basically, after hearing the well-produced CD, Separation Sunday, I thought I would see rock n' roll's redemption, instead, a false prophet it crashed and burned. They need an agent to control the lead singer's drinking and slobbering, and a sound person to make his voice discernable. The band behind him was generally tight and played well. They won't rocket to the top, but if they straighten out the vocals, they could begin a nice east coast following. The whole "four gigs in eight days" thing went great, except that I had a nasty cold the entire week. Thankfully, the fog of sickness broke on Saturday, the double-header gig day. All four playlists will be posted when there's time to type. Thanks to Johnny at the Ding Dong for letting me cut out early to nurse my cold (and to Dexter from Hoboken for stopping by! ), to the whole Tory Burch staff for their hospitality and good vibes, and to the Goldhawk crew for allowing the official Rock City iPod to DJ for me in absentia during the part of the gig where I went around the corner to Maxwell's so I could catch most of the ferocious Gefkens reunion set. I'm back at the 'hawk this Saturday at 10 p.m., as is the custom, and don't be surprised to see and hear me at both of those other two venues again soon.